We at mezéluna thank you, our dear guests, for your amazing support of our Makuhari-based restaurant, in operation from June 2017 until December 2018. As many of you already know, we will shortly reopen, bigger and better than ever, at a new location near Kujūkuri beach, on Chiba's Pacific Coast. The grand re-opening is expected to be in late April 2019. Please stay in touch via this website for specific information and updates. Once more, thank you very much for your interest in and patronage of mezéluna! We look forward to seeing and serving you again very soon! mezéluna is Chiba's first and only eatery and gourmet food brand inspired by the exciting, healthy, mouthwatering flavors of the entire Mediterranean region. Our restaurant menu, spice blends and other specialty products celebrate the diverse, delicious cuisines of all of the amazing countries and cultures that circle the Mediterranean Sea, including Croatia, Cyprus, Greece, Egypt, Israel, Lebanon, Morocco, Italy, Spain, Tunisia, and Turkey, among others. Mediterranean cooking is a symphony for the senses, a complex, yet harmonious blend of fragrant herbs, like coriander, parsley, and thyme; warm, earthy spices like cumin, clove, cardamom, cinnamon, and saffron; bright, succulent produce, like lemons, pomegranates, fava beans, and eggplants; tender meats - lamb a special favorite - and a wide array of fresh-caught fish and shellfish. Mediterranean dishes are also typically, perfectly accompanied by a great selection of creamy cheeses, yogurt-based dips, savory rice and grains, and warm, aromatic breads of many types and textures. Truly, though, there is no single Mediterranean cuisine, and exploring the depth and variety of all of the culinary traditions around this 'Sea at the Center of the Earth' is a delicious adventure indeed! We cheerfully invite you to embark on that adventure with us at mezéluna. Rie was born and raised in the food-obsessed city of Osaka, known by many as 'Japan's kitchen'. Naturally, then, she understands great food and loves to eat! She cares deeply, too, about the environmental and ethical dimensions of agriculture and the sustainability of life on our shared planet. Mark was born in Queens, New York City, and grew up on Long Island. Among other creative pursuits (writing, drawing, painting, traveling), he is passionate about cooking -- composing 'edible art' that is as exciting to see as it is to taste. 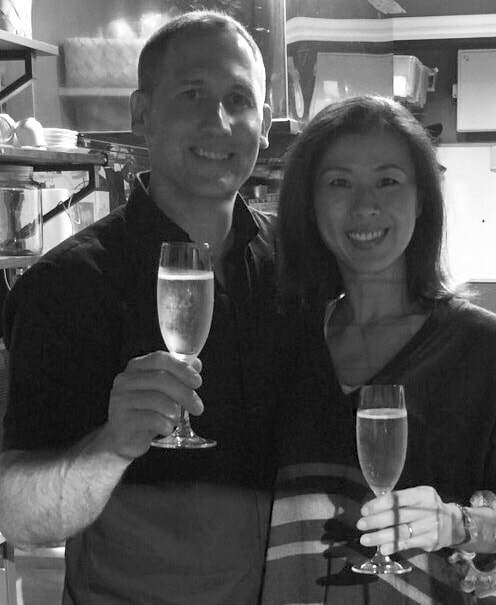 Both former educators, Rie and Mark met and married in Berkeley, California, while they were students. In the fifteen years since, they have also lived and worked in Singapore, Australia, and Japan. And on June 1, 2017, they embarked on their latest, most thrilling journey: mezéluna! ソーシャル・メディアにもぜひお越しください！コメントや評価なども大歓迎です!・Please visit us on social media! We welcome your comments and ratings!